Christopher Price of the Boston Sports Journal has reported that the ankle injury suffered by New England Patriots linebacker Elandon Roberts is not considered serious. Roberts went down with the non-contact injury during day five of Patriots training camp, but returned to practice later that day. Roberts played 344 snaps for the Patriots in his Super Bowl-winning rookie season. 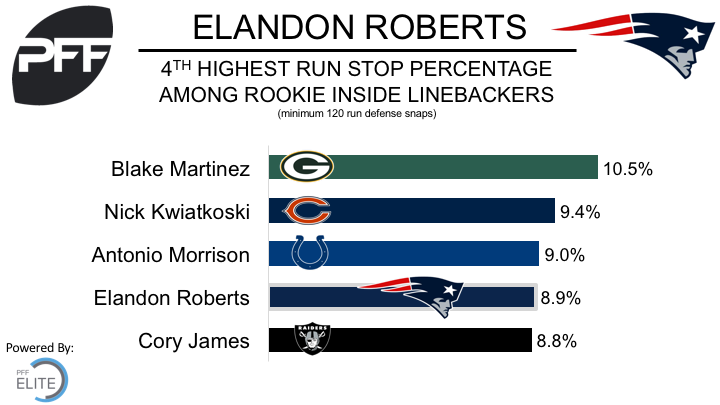 Roberts effectiveness against the run translated well, and he ended the season with the fifth-highest run-defense grade (71.5) among rookie inside linebackers. He produced 11 run stops on 124 run defense snaps, for a run-stop percentage of 8.9 percent that ranked fourth among rookie inside linebackers with at least 120 snaps. Roberts was drafted with the 214th overall pick of the 2016 draft, after a promising final season at the University of Houston. In the 2015 college season, Roberts led the nation in total defensive stops (75) and run-stop percentage (16.0 percent). He attained a PFF overall grade of 85.2, which ranked 25th of 402 qualifying linebackers.